The obstruction of sound occurs when a sound wave travels through a medium to another medium of greater density, such as an obstacle which is positioned directly in the path of sound, or through different regions of temperature, pressure, or density of the same medium. Sound waves which strike an obstacle or encounter a region of a medium of different temperature, pressure, or density are deflected, absorbed, and transmitted through the obstacle or region of the medium. The deflection of sound refers to sound waves which are reflected, scattered, diffracted, or refracted by an obstruction, and depends upon the dimensions, substance, and density of the obstruction, and the wavelength of the sound. If the dimensions of an obstacle are large compared to the wavelength of the sound, the sound wave is reflected or scattered by the obstacle in the direction of the region of incidence, with some of the sound being absorbed, depending on the degree of elasticity of the obstacle. If the dimensions of an obstacle are small compared to the wavelength, the sound is diffracted in various directions depending on the characteristics of the obstacle. If the dimensions of an obstacle are nearly the same as the wavelength of the sound, sound interference may occur. When a sound wave travels through regions of a medium which vary in temperature, pressure, or density, the sound is refracted in the direction of the region of incidence. An obstruction in the path of sound acts as a sound source which changes the direction of the original wave, and may cause a change in the frequency, amplitude, or intensity of the wave, usually by an amount which is imperceptible to the human ear. Normally, the frequency and amplitude of a deflected wave remains the same as that produced by the original wave. The shape of a deflected sound wave varies with the different modes of deflection, and depends upon the dimensions of the obstruction, and the wavelength of the sound. A portion of a sound wave which encounters an obstruction is absorbed and transmitted through the obstruction along a path normal to the direction of propagation, and the degree of absorption depends on the various characteristics of the obstruction and the mode of deflection. The frequency and velocity of an absorbed wave is increased, and the amplitude and intensity of the wave is decreased, due to the increased density of the obstruction. The shape of an absorbed wave is defined by the geometrical dimensions of the obstruction through which the wave passes. The absorption of sound is the process by which sound energy is diminished in passing through a medium to another medium of greater density, or through regions of greater density or lower temperature of the same medium. The absorption of sound is an energy transfer process in which sound energy is converted into heat. The absorption loss rate of a sound wave varies with density and temperature, and increases with frequency. The absorption loss in a sound wave is the energy that is converted into heat by friction, which occurs during the energy transfer process from a region of lesser density to a region or medium of greater density, or from a region of warmer to cooler temperature. The transfer of sound energy into heat energy is caused by an increase in the frequency of vibration and greater density of particles, due to the transmission of sound through the comparatively narrow passages in the medium, or by viscosity or heat conduction. Viscosity is the occurrence of molecular friction between two different regions of a gas or liquid that flow parallel to one another at different speeds or temperatures. Heat conduction is caused by friction due to variations in temperature in different regions of a medium. A portion of the energy or momentum in a sound wave which travels from a warm region of a medium to a cooler region is absorbed into the surrounding medium. 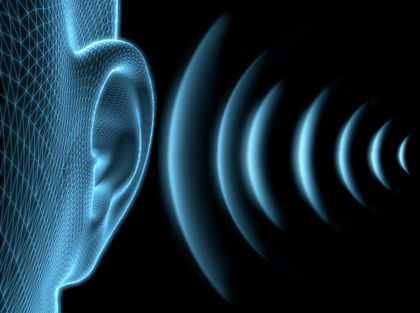 Under certain conditions, some of the particles in a sound wave may travel with the wave, which can lead to the absorption of sound caused by diffusion. Diffusion is a result of friction caused by the interpenetration of moving particles or molecules between two different gasses, liquids, or solids. The loss of energy due to the absorption of sound is inversely proportional to the sound intensity. An increase in the energy loss of a sound wave due to absorption results in a decrease of intensity. A sound source in a liquid medium can produce a disturbance with enough intensity to convert sound energy into heat energy at short distances. Although heat is generated when sound is absorbed, sound waves do not produce a noticeable warming effect. Acoustic impedance is a measure of the total resistance of sound energy which occurs at the boundary interface between one medium and another, and depends upon the relation between the substances contained in each medium. Whenever a sound wave encounters a boundary between one medium and another, a portion of the sound is deflected, and the remainder of the sound flows into the new substance which is absorbed in various degrees depending on the medium. The distribution of sound energy at the interface between two different media is measured by the ratio of acoustic impedance of the two substances. The ratio of acoustic impedance is inversely proportional to the loss or gain of sound energy in the transfer process from one medium to another. The greater the efficiency of the transfer of energy across the interface, the smaller the ratio of acoustic impedance. The acoustic impedances of rubber and water are nearly the same, and sound is transferred from one to the other with little energy loss due to deflection or absorption. At the interface between air and water, the ratio of acoustic impedance is 400 to 1, and nearly total deflection occurs with only a slight amount of sound energy being absorbed. An incident wave refers to any wave which changes its direction of propagation as a result of striking an obstacle, or encountering a different medium or region of a medium. An incident wave initiates a subsequent wave which is deflected or absorbed in various directions. The point of impact at the boundary between the original wave and the deflected or absorbed wave determines the angle of incidence and gives the direction of both the incident wave and the subsequent wave. Trapped waves are deflected waves which are continuously reflected or refracted within an enclosed boundary. A cross wave refers to any wave, or part of a wave, which intersects another wave at an angle greater or less than 180 degrees. Intersecting waves normally occur within an enclosure or partial enclosure, or near a boundary interface, as a result of sound reflection or refraction. Sound reflection refers to a sound wave which strikes the uniform surface of an obstruction, causing all or part of the wave to be deflected in the direction of the region of incidence. When a sound wave in a medium encounters a rigid obstacle which is large compared to the wavelength of the sound, most of the sound is reflected by the obstacle. If the dimensions of the obstacle are small, the sound wave bends around the obstacle, and the reflected sound is negligible. The angle of reflection of a sound wave is equal to the angle of incidence. A reflected sound normally has the same frequency, amplitude, and intensity as that produced by the original sound source. Short waves, or high frequencies, tend to be reflected by a large obstacle, while long waves, or low frequencies, will bend around the obstacle due to the impact of the stress forces on the longer waves. When sound waves are produced within an enclosed or partially enclosed boundary, they are continuously reflected by the obstruction or obstructions which define the boundary. As the reflected waves interact with one another, they maintain their individual characteristics, crossing and overlapping at various angles, and causing a slight time delay, resulting in the reinforcement of the original sound. When reflected sound waves interact with one another and have exactly the same or opposite phase, they create interference patterns which may reinforce or weaken the sound, depending on the kind of interference which occurs. Sound resonance is the reinforcement of sound caused by continuous reflections produced within an enclosed boundary, by sound interference, or by sympathetic vibrations. The resonance of a sound produced by continuous reflections within an enclosed boundary increases with time as the number of reflections increases. The mean free path for sound waves is the average distance the sound travels between successive reflections within an enclosed boundary. An echo is a sound which has been reflected with sufficient strength and time delay to be perceived as a sound wave separate from the original wave. A multiple echo is a succession of separate echoes originating from a single source. A multiple echo which occurs within an enclosure will produce a reverberation. A reverberation is a multiple reflection of sound waves which persists for a significant duration of time after the sound source has ceased to vibrate. The extent of the reverberation depends on the strength of the original transmission. The greater the strength of the initial sound, the more reflections occur and the longer the reverberation time. A normal sound produced in an enclosure which has a short reverberation time will reflect a greater number of short waves, or high partial tones, than long waves, or low tones, causing the overall frequency of the sound to be significantly increased, due to the reinforcement of the higher frequencies. In an enclosure with a long reverberation time, the short waves are diminished, due to the continuous loss of intensity caused by the increased number of reflections of the higher frequencies. A flutter echo is a rapid succession of reflected waves resulting from an initial wave. The scattering of sound occurs when a sound wave is reflected by a rigid obstacle which has various angles associated with its surface, such as the uniform curved angles of a cylinder or sphere, or the nonuniform angles of an irregular surface. When a sound wave encounters an obstacle consisting of various surface dimensions, the reflected wave is separated into some or all of its constituent waves, which depends on the dimensions of the surface. The variations in the surface of the obstacle act as second sound sources which scatter the waves in various directions, and at slightly different times, depending on the angles of reflection and the dimensions. Normally, scattered waves produce an overall sound which has the same or nearly the same frequency and amplitude as that of the original wave. However, various scattered waves may interact with the incident wave, reinforcing or cancelling part of the sound, while other waves may surround the obstacle, depending on the phase relations between the waves, the size of the obstacle, and the wavelength. In addition, the scattering of sound may produce natural sound effects such as a rapid frequency shift or multiple echo, caused by a time delay between the various reflections. A rapid frequency shift is produced when normal sound waves are introduced into a large open tube such as a culvert, and are reflected from side to side as they travel along the length of the tube. The short waves have less distance to travel between reflections and arrive sooner than the long waves, which may result in the perception of a noticeable descending tone. A multiple echo occurs when a succession of scattered waves is generated by a series of large uniform surfaces such as a staircase or picket fence, and is caused by the comparatively long time delay between successive reflections. A multiple echo generated by a series of uniform surfaces is accompanied by a musical tone which has a frequency that depends on the interval of time between successive reflections. Sound diffraction refers to the deflection of sound waves around a small obstacle or part of an obstacle, or at the edge of a large obstacle or restricted opening. When the dimensions of an obstacle are small compared to the wavelength of the sound, the sound wave bends around the obstacle causing sound energy to be transmitted into the regions along the side or behind the obstacle. If the dimensions of an obstacle are large compared to the wavelength of the sound, most of the sound is reflected at the surface of the obstacle, and diffraction occurs at the edges. When a sound wave strikes a small obstacle or the edge of an obstacle, it bends around the obstacle due to a slight shear force which changes the angle of direction just enough so that the wave is deflected around the obstacle. The bending or diffracting of a sound wave around an obstacle is directly proportional to the length or diameter of the obstacle around which it passes, and is inversely proportional to the wavelength of the sound. Long waves, or low frequencies, tend to be diffracted around a large obstacle, while short waves, or high frequencies, are reflected by the obstacle. When a sound wave is diffracted around an obstacle, the obstacle produces a sound shadow which is nearly identical to the original wave. The dimensions of a sound shadow cast by an obstacle depend on the size of the obstacle, and the wavelength of the sound. When sound waves bend around a comparatively small obstacle, the sound shadow cast by the obstacle is negligible. When sounds bend around a large obstacle, the obstacle produces a nearly perfect sound shadow. A diffracted wave normally vibrates at the same frequency and amplitude as that of the original wave. When a sound wave is transmitted through a restricted opening, it is geometrically defined by the opening, and is diffracted over the entire edge of the opening without regard to the dimensions of the obstacle, or the wavelength of the sound. A shear wave is a plane, transverse wave which vibrates at right angles to the direction of propagation, and travels at normal, subsonic, or supersonic speeds. The waveform in a shear wave is a narrow beam of sound that bends and curves in the direction of sound transmission. A shear wave is produced as a result of a shear or stress force, which acts in the plane of an area, or in parallel planes. When a normal sound wave encounters an obstacle or region of a medium of different density at a near parallel angle, it curves away from the object or region in a direction equal to the angle of stress. The resulting shear wave changes it’s shape without changing it’s volume, producing a narrow beam of sound which continues along the path of travel in the direction of sound transmission. The particles or molecules in a shear wave vibrate transversely at right angles to the direction of propagation, due to the parallel angle of stress produced by the various collisions along the boundary. The speed and direction of a shear wave is dependent on the compressibility, rigidity, and density of the medium in which the wave is traveling. A shear wave tends toward rotational motion, and under certain conditions will describe a nonlinear path in the shape of a spiral or coil. Sound refraction is the bending upward or downward of a sound wave traveling in a horizontal direction, which is caused by the deflection of sound through different regions of temperature, pressure, or density of a medium. The bending or refracting of a sound wave is determined by variations in the velocity of propagation, caused by a progressive change in temperature, pressure, or density of a medium. When disturbed particles in the air vary according to temperature, part of the sound wave is refracted either upward or downward depending on the speed of travel. The direction of the bending of refraction is always away from the particles in a sound wave in which the speed of travel is fastest. Since sound waves travel faster in warm air than in cool air, when the air temperature decreases with height, the upper region of the sound wave will propagate slower than the lower region, and the path of the wave will bend upward. Sound waves which originate close to the surface of the earth, and are cool in temperature, will spread out in all directions until the waves reach a warm upper layer, where they are bent back, and eventually turned downward to continue through the lower layer. When a sound wave is generated in cool air close to the earth’s surface, only a small fraction of its energy passes into the warm upper layer before it is bent backward to the surface. Since little energy is absorbed by an upward spreading of sound waves in air, sound may be heard over great distances when it is bent downward. In liquids or solids, the refraction of sound depends on a change in pressure or density, rather than on temperature. A refracted sound wave produces a shear force in which the volume of the medium occupied by the wave is defined by the dimensions of the region of refraction. A refracted sound wave has the same frequency and amplitude as that produced by the original wave.